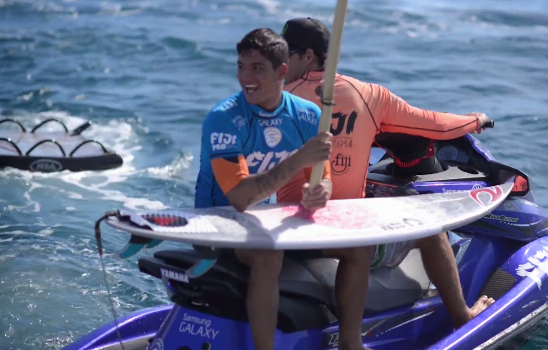 Brazilian Gabriel Medina handled Nat Young in the finals of the 2014 Volcom Fiji Pro held at Cloudbreak in beautiful, barreling 3-4 foot waves. With the win, his second of the season following his win at the first event of the year, the Quik Pro Gold Coast, Medina leapfrogged from 4th place to 1st place overall in the WCT standings. Medina faced off against Koloho Andino in the semis and was able to handle him with ease, scoring 9.07 and 8.43 waves en route to a 17.50 to 9.57 victory. In the finals Medina met up with Nat Young, who defeated Michel Bourez in a much closer semifinal. Medina scored a few early waves in the final to put the pressure on Nat, including a 7.33, but after waiting patiently for 15 minutes, Nat responded with a barrel ride and a couple of clean hacks that scored him an 8.17. Medina answered right back with the wave of the final, a 9.87, and then an 8.53 to put Nat in the combo situation, needing two huge waves, which he couldn't get. With the win Medina moves into first place overall on the WCT standings, jumping up 4 spots and leapfrogging guys like Kelly Slater and Taj Burrow. Following another strong showing, Michel Bourez, also with two wins on the season, moved up himself into second place, followed by Slater, Burrow and Parkinson. Stop #6 on the season is the J Bay Open down in South Africa from July 10 - July 21.